As per estimates released in 2015, Deafness or hearing loss affects 1.1 billion people globally. There are many causes of deafness ranging from trauma to the ear to severe infections, developmental issues as well as exposure to noise. However, 80% of deafness cases are non-syndromic i.e. do not show any other symptoms such as ear malformations and are also genetic in nature. Cochlear implants have met a lot of success in recent years but come with its own set of benefits and risks and are definitely not a permanent cure. 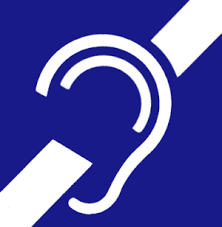 Like with any other genetic condition, deafness, too, has been known to be non-curable. But recently published research puts hope on the horizon for patients with deafness that gene editing technology could one day become mainstream and allow treatment for genetic deafness. Gene Editing technologies have taken the scientific world by storm in the recent years. Among these, CRISPR - Cas 9 system has gained quite a reputation for itself. What was published as general find in understanding bacterial immune system in 2011 took only 5 years to become a popular gene editing tool powering over 2200 publications (in the year 2017 alone) from labs across the globe. Not to mention a long patent war that is just getting started leaving the Next Gen Sequencing patent wars far behind. 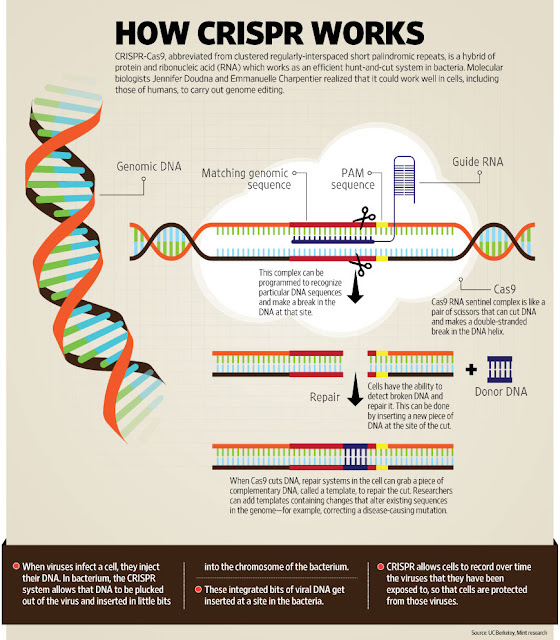 Among its laboratory accomplishments, CRISPR- Cas9 based gene editing systems have so far solved the medical issues such as Muscular Dystrophy, HIV, Lung Cancer, dyslipidemia, Sickle Cell Disease and Myocilin associated Glaucoma to name a few. Autosomal dominant hearing loss is the most recent addition. In Autosomal dominant genetic conditions, inheriting a single copy of a mutation is sufficient to cause the disorder. Such mutations can be inherited, either from the parents or are de novo ( new). The latter are more difficult to predict in any family and their occurrence cannot be predicted through prenatal tests as well. Since, such a disease can neither be predicted nor cured, medically, there is no help that can be provided to improve the quality of life of the patient. This is where gene editing technologies come in. The TMC1 gene on Chromosome 9 is a fairly big gene that encodes for transmembrane protein required for normal functioning on cochlear hair. 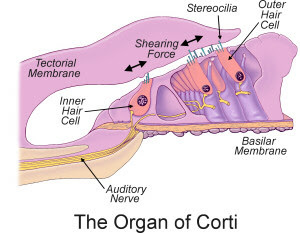 The outer hair cells (OHC) amplify the sound received by the ear, whereas the inner hair cells (IHC) detect the sound and transmit to the brain. (The Maciver Lab at Edinburgh University has a wonderful page about Hearing, Hair Cells and Cytoskeleton). While the function of the gene and the transmembrane protein is not yet completely understood, it is well known that even single base mutations in TMC1 leads to prelingual deafness. The Beethoven mouse model carries a single base mutation in Exon 13 that disrupts the transmembrane protein. The entire mouse strain is born deaf and used in labs to understand the genetics of deafness. Researcher Xue Gao and her colleagues while working under the guidance of Prof. David Liu at Harvard University, were able to use the CRISPR-Cas9 system to specifically target this single base mutation. While editing a particular mutation in the lab is achievable, what is commendable in this research finding is that the researchers attempted and were successful in editing the mutation in the gene in a living mouse. Researchers performed cochleostomy i.e. surgery on the cochlea of the ear, on day one of life of Beethoven mice, to deliver the CRISPR -Cas 9 complex along with a RNA molecule that directed the editing process inside the cells. After eight weeks, the cochlea of these mice were removed to study the response to the injection. While untreated mice, showed loss of Inner Hair Cells (IHCs), mice whose mutations were edited showed significantly enhanced number of IHCs. Additionally, auditory responses were tested in all mice using a startle test. In this the mouse in kept in a sound proof chamber and then sound is played from behind. Beethoven mice, being deaf do not react to any sound produced during the test, whereas mice which were treated responded to sounds around 110 - 120dB. These findings are extremely uplifting for patients with hearing loss, since it marks the first step among many before such a treatment can be made available to them. In the year 2007, Spark Therapeutics began clinical trials with a different method of gene delivery into cells (no mutation editing involved here) that could correct the gradual loss of vision in patients who had specific mutations in the RPE65 gene, associated with retinal dystrophy. The FDA recently approved the drug, which will be sold as Luxturna. I leave with a short video from Spark Therapeutics that explains its method of gene therapy and let you imagine what our future will be.